A stubbed toe can be very painful and make it difficult to walk. When it is the pinky toe, it can really hurt. The injury can turn purple due to blood clots. In severe cases, the nail will lift and bleeding may occur. Is it possible feel the pain a few months after jamming your toe? How long does it take to heal a broken or bruised toe? Can first aid at home relieve the pain or should you go to the emergency room? Note that if proper care is not taken, your toe can get infected and start to ooze pus. Stubbing or jamming your toes is a little injury as a result of your daily activities. This might include when you are walking or carrying out normal chores. The experience is painful but the good news is that it will go away. The injury should not cause much alarm because you can easily treat it at home. The stubbed toe occurs most frequently when you are walking barefoot. In the course of time, you might collide against a wall, furniture or any solid objects on the floor. If the pain subsides, this is normal. If it doesn’t, then there is something to worry about. There are times when the injury is severe and would call for immediate medical attention. It is at times so hard to an extent that it causes a fracture of your toe bones. This in the course of time causes positional deformity. It is always a good practice that when you are in doubt about the position and condition of your toe, see your doctor. t is here that you will get an X-ray done so as to commence treatment soonest. This should be treated urgently to avoid further damage. Your foot should stop hurting in a few hours although mild pain may remain. If it persists, see a doctor as soon as possible to rule out the chances of a fractured or broken tarsal. In our toes are nerves that are so sensitive that they send signals instantly to the central nervous system. That explains why the pain is exaggerated. But why do you get jammed toes easily and often? When walking outside and mostly in so much hurry, you may hit your foot accidentally against a stone or a piece of furniture. Usually, your toe gets stubbed since, you were in a hurry and that is the same force with which your foot hits the hard surfaces. It is very hard to get your toe badly jammed when you have your shoes on. At least, the shoe surface reduces the ease with which the surface your toe hits against reaches to it. However, when you walk bare footed you end up hitting surfaces so easily. This are the kind of shoes that leave part of your toes exposed to the surface. In their case, you will easily hurt your toe if you get hit by mistake. Therefore, such shoes increase the probability of getting a broken foot or fingernails. When your leg is injured, you not only experience a toe fracture but you can also experience more complications. Such complications include dislocation, ligament sprain, contusion, tendon injury, or other injuries on the soft tissue. Due to the possibility of such complications, your doctor orders radiographs so as to determine whether there are other injuries that come with the toe fracture. The doctor will carry out an inspection on the feet to find out if there is any form of deformity. When a deformity is located, it shows a displaced fracture and dislocation. To distinguish a contusion from a fracture, your doctor gently applies maneuvers which move the toes upwards and downwards. Your skin is also inspected for any wounds that are open and any noticeable injury. This may be identified in case you have bleeding under your nail. Your doctor also assesses how your capillaries are refilled. In simple terms, the doctor strives to determine the rate at which blood refills the capillaries that are left empty. Usually, the doctor applies pressure on the nail bed of your toe with an aim of blanching the nail bed. The doctor then releases the toenail and sits back to see how long the nail takes to get a red appearance from the initial white color. This normally takes about two seconds. If the toenail takes longer than thing to get back to the red appearance, there is a circulatory compromise. To establish any point of tenderness, palpation of the toes and the feet is done. This is present on the site of fracture. Localized contusion tenderness sometimes mimics the tenderness of the fracture. Discoloration of the toe nail is common when your toe gets stubbed. A stubbed nail will turn black or blue in the case where it is very severe. Therefore, when you notice such color change shows that the injury is very severe. When your toe gets seriously injured, the blood vessels under the nail break. This is what causes the bleeding. The blood collected under your nail is responsible for the blue, purple or black color noticed. There are several treatment options you could try out. Nevertheless, you must remember that the effectiveness of these treatment methods works differently depending on the severity of your condition. Before settling for any form of treatment, it is important that you examine the condition of your foot first. Check to find out if you have any wounds, tears or cuts. Next, check to see if your nail has been displaced by any chance. Finally, you could get an X-ray to establish if your toe is dislocated or if you have bone fracture. In case of dislocation or bone fracture, you are advised to see your doctor as soon as possible. Below are some ways of treating the injury and relieve pain. Antibiotics are good for an infected stubbed toe. In the case where the contused toe causes the skin to be torn, the risk of getting an infection is very high. You are therefore advised to wash the affected area immediately with warm water and then apply the prescribed antibiotic. When the foot and nail gets swollen, the first thing you will need to do is reduce the swelling. This can be done by simply raising your foot to a higher level while you are seated on the bed or on a chair. With the swollen area raised above the rest of the body, it becomes very difficult for the heart to pump blood to the area. When blood supply is channeled away from the injured toe, the swelling is highly reduced in a very short while. Another way to reduce the swelling is using a cold compress. Wrap ice cubes on a towel and place them on the stubbed nail for about 15 minutes. The pain will reduce with time. You must always remember not to apply the ice packs directly on the skin as this may only make the condition worse. Until you get healed, avoid walking in a hurry. Be careful when you walk. 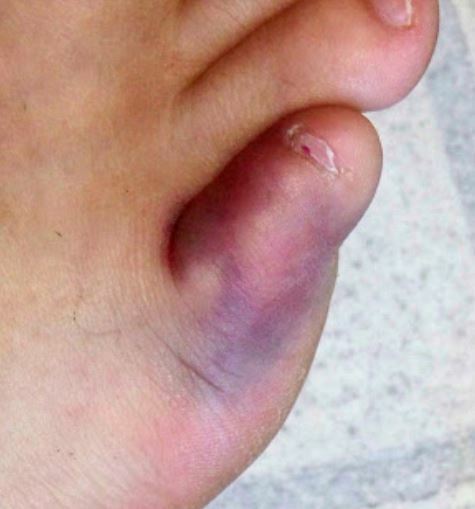 This is because, bruising the toe once more before it heals only prolongs the recovery period. Wear open shoes to avoid putting pressure on the toe. A closed shoe may exert pressure on the toe. Such straining on the toe makes it difficult for its recovery. Too much pressure may end up making any crack on the jammed toe larger. Avoid too much heat. This is because; heat dilates the already torn blood vessels. Consequently, you will experience a build-up of fluid on your toe. This worsens its existing condition. Avoid wrapping the stubbed toe since you may do it incorrectly. When done incorrectly, wrapping of your toe will do more harm than good. Try as much as possible to stay off your feet for at least. This gives the toe some good time to relax. When free from all forms of pressure, the stubbed pinky toe heals in a very short while. Home remedies are very important treatment alternatives that you can consider. They are not meant to substitute the treatments by the doctor. They are meant to provide relief from the mild pain that may occur. They are first aid measures to prevent further damage. You should be sure to report the case to your doctor as soon as the injury has occurred. This is to prevent the likelihoods of deformities on your toes. This is herb is related to the sunflower. It is very good natural treatment for bruised toenails and the toenail health in general. It is very useful because of its high anti-inflammatory properties. Therefore, when you apply it to the area of injury, it relieves swelling. further, it is able to give you relief from pain. it does this by improving the circulation of blood beneath the skin. Arnica comes in very many different forms. The best treatment for your damaged toenail is the arnica gel. This is better compared to the gel because it dries more quickly and does not leave your toenails feeling greasy. Better still, you could use the arnica tincture that is diluted with water. To do this, you should apply the preparation on some day per week till you get relief. Most essential oils are useful because of their anti-inflammatory properties. They are hence ideal for helping you out with your bruised toenails. There are other oils that are generally analgesic in nature. They include peppermint among others. What they do is to help relieve the pain and swelling on your skin. Alternatively, you could put some oil in a bowl of warm water. After that, soak your foot in the solution for about 15 minutes. Carry out this process several times in a day to get relief. Better still, you could add about 6 drops of your oil of choice to a warm damp cloth. This is also a very useful home remedy. The reason behind its use is because it contains very strong anti-inflammatory properties. Further, it has antimicrobial compounds. These compounds help relieve swelling. More to that, they prevent future infection. Get a tablespoon of the turmeric and then add some water to make a paste. Mix the ingredients well so as to make a uniform and smooth mixture. You should apply the paste to your bruised toenail at least two times in a day. Some doctors prescribe mustard oil because of its anti-inflammatory and pain relieving properties. The process of using this oil is very simple. You just have to massage the oil into the affected toe several times in a day. On the other hand, you could also add to the oil some flour and make a dough. Then wrap the dough around the toe. This is one of the best remedies for injuries and bruising of your toenail. The reason is because it has anti-inflammatory properties. You could prepare a gel out of the leaf or even obtain a ready-made gel from the shop. What you have to do is get the gel and then massage into your bruised toe several times in a day till you get relief. This herb is known because of its anti-inflammatory properties. All you have to do is get some witch hazel and then add some water. After that, wash your bruised toenail a number of times in a day till the symptoms subside.